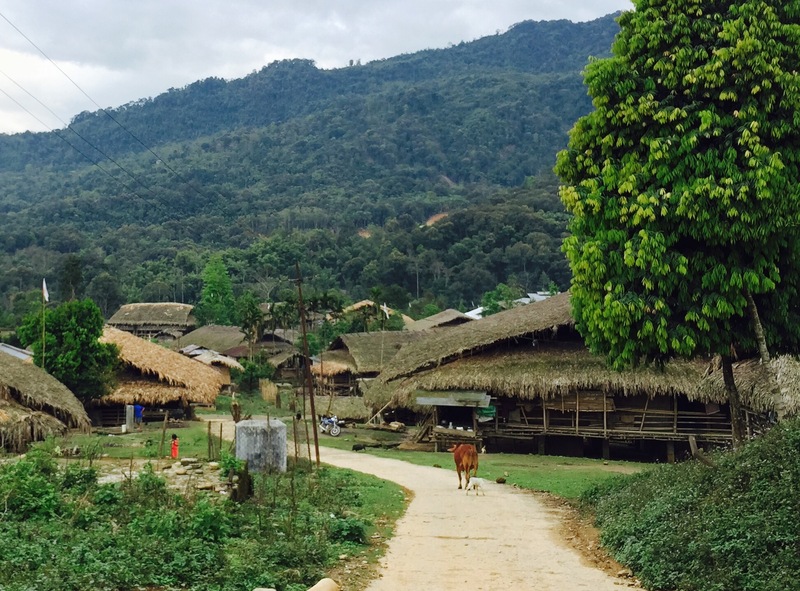 The Mystical Ways of Arunachal Pradesh’s Galo Tribe. I will never forget that moment. 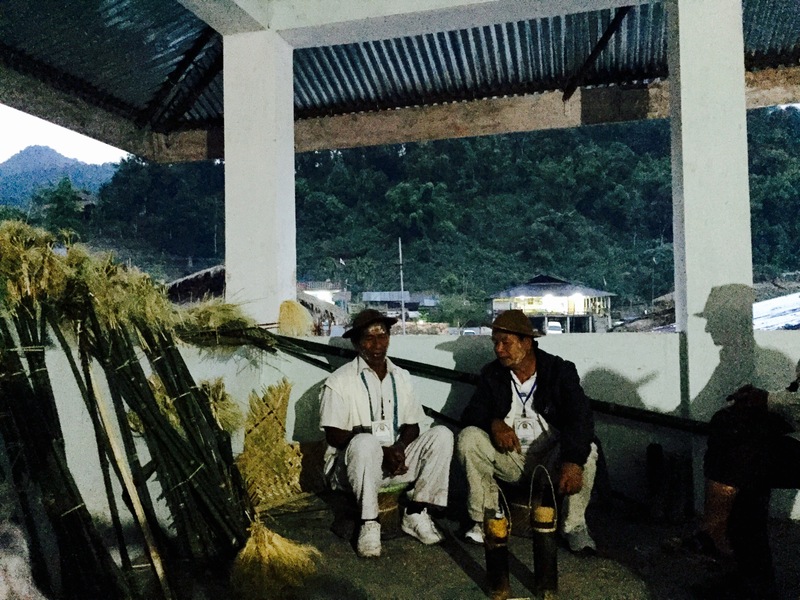 In the house of the village pradhan, I sat with the who’s who of Arunachal Pradesh, sipping apong from a bamboo stem. My empty tummy grumbled as our gorgeous hostess appeared with a tray of starters. At first glimpse, the food looked gray, finely chopped, hairy. What is it? our troop asked in unison, all seven of us curious visitors, here to celebrate the biggest festival of the Galo tribe – the Mopin. My jaw dropped. Someone spilled their apong. Rats? RATS? Mopin is a time of delicacies, so rats were followed by flying squirrels, pig blood barbecued in a bamboo stem, and finally bear meat. I was glad my vegetarian taste buds had consumed enough apong, a mildly potent homemade rice brew, and were too intoxicated to react to the surprising menu. 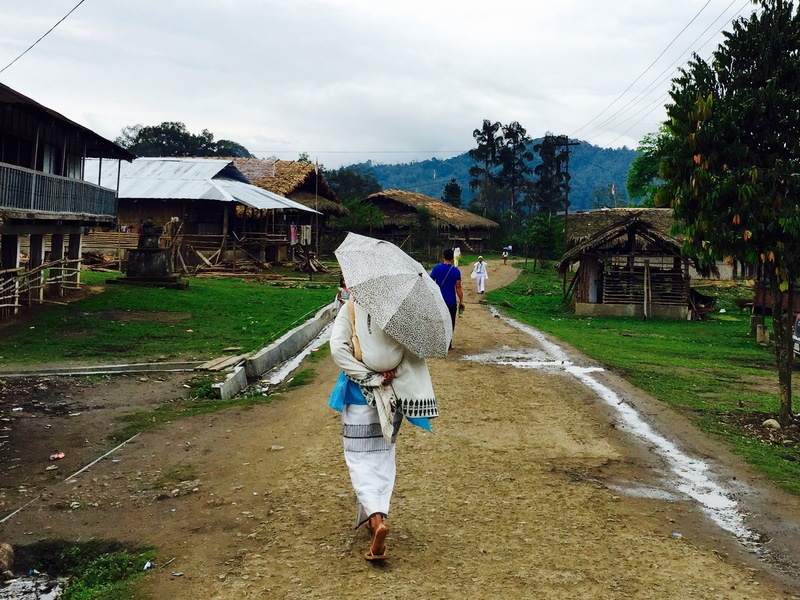 Arunachal Pradesh, tucked away remotely in the northeastern Himalayas of India, surprised me in unfathomable ways. From the moment we crossed the mighty Brahmaputra on a ferry and drove across the nameless border from Assam into Arunachal, a raw, wild, dense forest cover became our constant companion. Time and again, along bends in the empty broken roads, we saw young men emerge out of the forest with a big gun on their backs; hunting, although illegal in these parts, is still the way of life. Women, young and old, walked far to collect wood and grain in their wooden baskets, precariously balanced with a rope on their foreheads. The village of Darka, near Along. Our refuge was the traditional wooden home of an elderly Galo couple in Darka village; pigs and poultry crowded the level below, and in the large room under the thatched roof, sleeping, cooking and life revolved around a central open fire. By morning, we gathered around the fire for tea and conversation, and by night, we tucked into our sleeping bags, beside pillars decked with animal heads, thankful for the warmth of the dying coal. The festivities of Mopin were curious and surreal. We were invited into village homes, where rounds of apong were interspersed with interesting conversations, and sometimes even an invite to get married into the Galo tribe! Tug of wars had mothers-in-law and daughters-in-law compete with each other. Younger ones gathered at open wooden community halls, drank Kingfisher beer (! ), danced to local tunes and jarring Bollywood music, and practically begged us to dance and take photos with them. 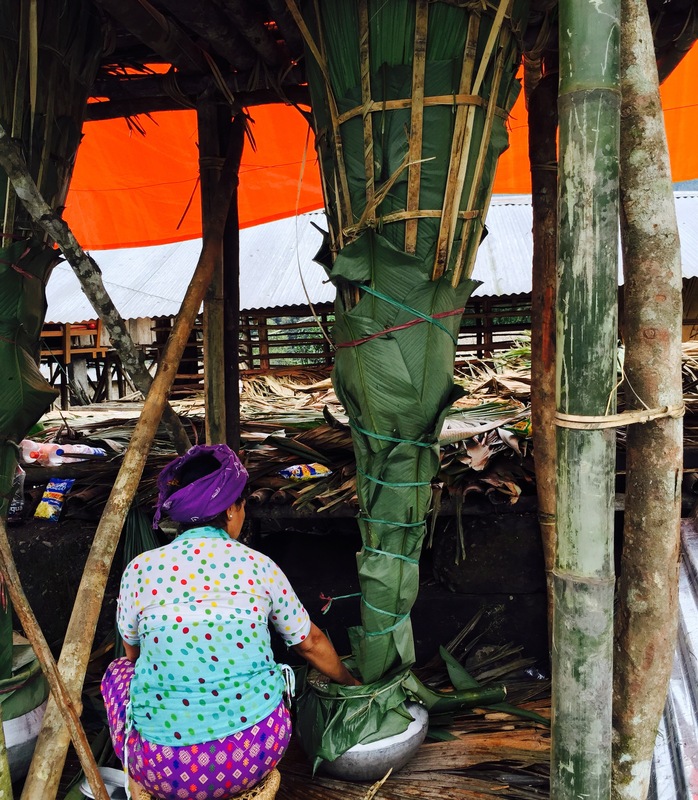 Women manned large bamboo structures, brewing apong for the entire community. Mithun meat (a semi-wild creature midway between the buffalo and the Indian gaur, found all over the state) and boiled mustard leaves did the rounds. Shamans chanted hypnotically by night, in the ominous backdrop of rainy grey skies, to calm the spirit of the animals that were to be sacrificed the following day. Women making Apong in a large bamboo basket. Though white is the color of Mopin – women dressed in elegant white gales (long skirts) and men in embroidered white half jackets – the color I associate with the festival is red. The color of animal sacrifice. 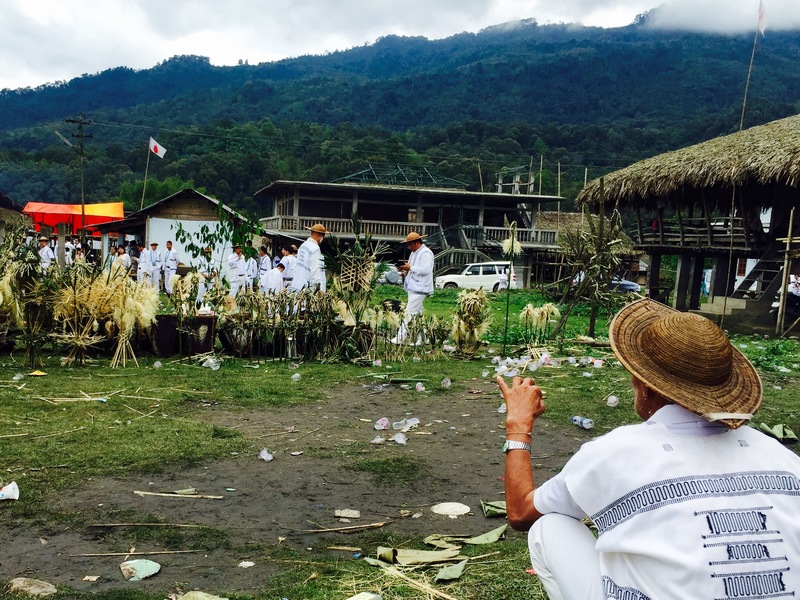 Trance-like dances in the dramatic backdrop of mist-covered hills were followed by mass sacrifice. Four mithuns, pigs, chicken, birds, even a dog, were sliced off, live, to appease the spirit of nature, the sun and the moon. 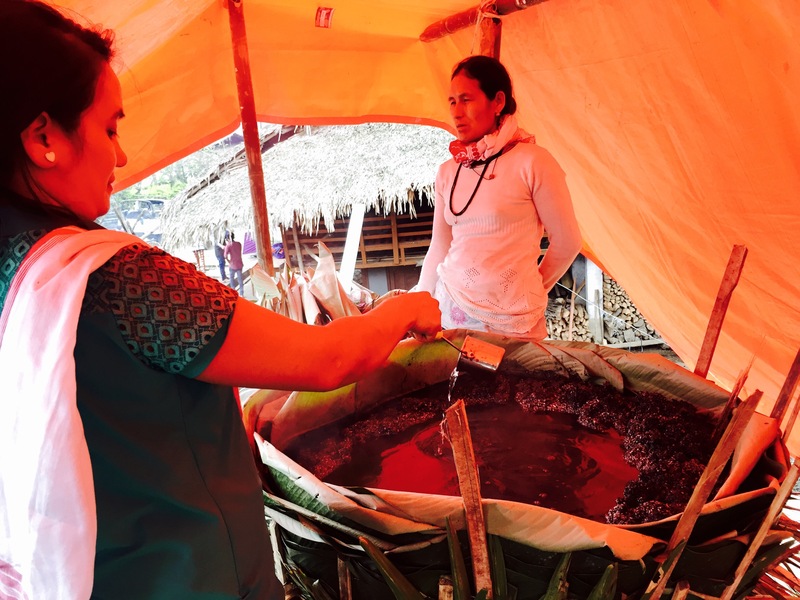 The ‘tastiest’ animal parts were distributed to the most important village folk and so on, and people came to collect mithun blood in bamboo stems to make chutney from it. A Galo elder looks on at the festivities of Mopin. A hunter I met while walking away from the sacrifice area, confessed that he would kill and eat any animal except a tiger. Among the Galos, killing a tiger is equivalent to killing a human, and in penance, one must turn vegetarian and sleep away from his wife for months of repentance! 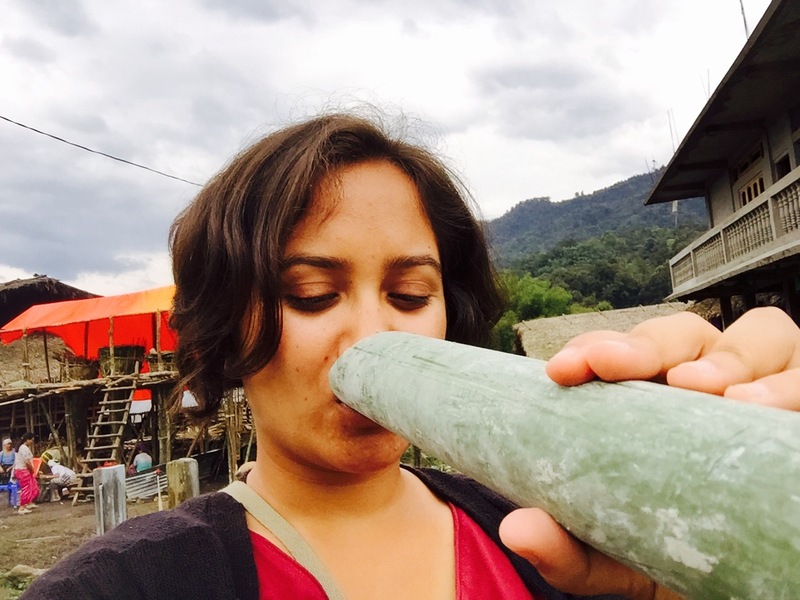 I dwelled over Arunachal Pradesh’s tribal culinary traditions long after my trip, and concluded that eating one animal (rat, squirrel, what have you) is no different from eating another (chicken, cow, pig)… but I wasn’t there to judge. I was there to observe a world so different from mine, yet wrap myself in the raw warmth of the Galo people. It is the furthest I’ve journeyed away from my comfort zone. A Galo woman walks on. When was the last time your travels really pushed you out of your comfort zone? My travels in Arunchal Pradesh were organized by Kipepeo; its founder Piran is like the wikipedia of Northeast India and the best person to plan your trip! Join me on Twitter, Facebook and Instagram for more travel adventures! Sounds like a fascinating trip Shivya! I’m dying to visit Arunachal Pradesh! It sure was, Sarika! Hope you get to go soon, since the tribal way of life seems to be fast disappearing with the older generations. Hi Shivya….very well written. I can connect to ur experience…I recently visited my wife’s place which is Old Deka in East Siang. It surely is a different world out there. People are so loving, very connected to their culture, I enjoyed every bit of my stay there. The village I went to is near Assam border. I enjoyed their food as I am quite a foodie and won’t mind trying different and new dishes as well. As it was New year’s time I witnessed their picnics as well. I am being told to relocate somewhere nearby so that they can meet their daughter more often. I plan to go further ahead in my next visits. Sarika – Though journey is long but its worth seeing. Still not exploited by the outside world. Must see place especially places like Tawang, Bomndila, Along, Pasighat and Namsai (Of course not to forget the capital Itanagar). Very cool trip and place, I would love to go there some day! Do that, plan a trip 🙂 A most surprising part of India! I will go in october!! Really enjoyed reading this post! I have never heard about any of these customs… Arunachal Pradesh sounds like such a fascinating place! Love how this trip took you farthest away from your comfort zone – places in our own country can be so different from a place really far out in the world. Thanks Chaitali! I couldn’t have anticipated any of these customs either. Yeah, it’s amazing how much about India we don’t (and may never) know. I love how your travelogues transport me to the place you’re describing. 🙂 I’ve been wanting to visit Arunachal for a long time now; high time I should plan something now. ” even an invite to get married into the Galo tribe! “- hahaha… this really made me laugh out loud. So how did you manage to get yourself out of this swayamvara?? 🙂 Jokes apart, your article nearly made me quiver at times specially wondering at the wide range of sacrifices they do on this occasion but that’s their local delicacy. Even while I stayed in Shillong for 3 years long time back heard tales from some Nagaland friends. They do indulge in these wide range of proteins as a daily affair! 🙁 Your article inspires me to travel back to India, my country, fast enough and explore every bit of it! Time indeed for you to travel back to India and discover how much of our own country we have no idea about! 3 years in Shillong must have been quite an experience. Writing about it? Love your travel trip and the way you have weaved other community stories into the same piece. Interesting read! I have been to the north east and explored much of AP including the beautiful Tawang. But this really captures the true essence of the place . loved it! Thanks Aradhana! I heard so much about Tawang and the villages around, and how different it is from the land of the Galos. Hope to visit someday! I love this- it reminded me so much of living in rural Nepal. Similar looks and the same challenges that ignite your love for authentic travel. It’s such a beautiful, and welcoming, area of the world! Thanks Alexis! It absolutely is, off to see if you’ve written about your time in rural Nepal yet. Want to read it now more than ever. Very Nice blog and informative information you have given here. I want to share few travel related information with you can you share me your email id. Thanks! Feel free to leave a note here; I’m really behind on emails! Sick to hear these guys routinely kill and eat wild animals. Apart from being completely illegal, they are also destroying the entire biodiversity. ‘Tradition’ should not be used an an excuse to continue with such regressive practices. I know how you feel, I felt a little like that too at first. But you know what – eating domesticated chickens and cows and pigs and what not is even worse if you think about it. We have removed these animals from their wild habitat entirely. Hell, we’ve changed their internal body systems so they produce eggs everyday instead of only during their reproductive season. To eat grain, we’ve destroyed tons of forests for agricultural land, and hence the entire habitat of wild animals! It’s all a grey area if you think about it. The article is very informative.Image quality is very good.Thank you for provide detail information. What a coincidence! My roommate is Galo! I have shared this with her. She’d love it. The pleasure and satisfaction which dawns over oneself while penning down some exciting moments in life is immiscible with any other form of writing! The bamboo- based beverage saved must have been a thrill to dive into all of it. The RATS!! Wow!! Quiet an adventurous eh?? Thank you bringing this lost kingdom into the limelight! “Hey Shooting Star, I keep coming to this post very often and it seems I loved this piece of writing cause it has everything those feelings felt from the heart ought to be portrayed with. Ahhh ! Really the post made me feel like i am having those days back when i was there in daporijo…the subansari river the mountains the rains and yeah apong too ! A great post indeed maybe being selfish but i framed my childhood days through your post …keep posting …have fun !! 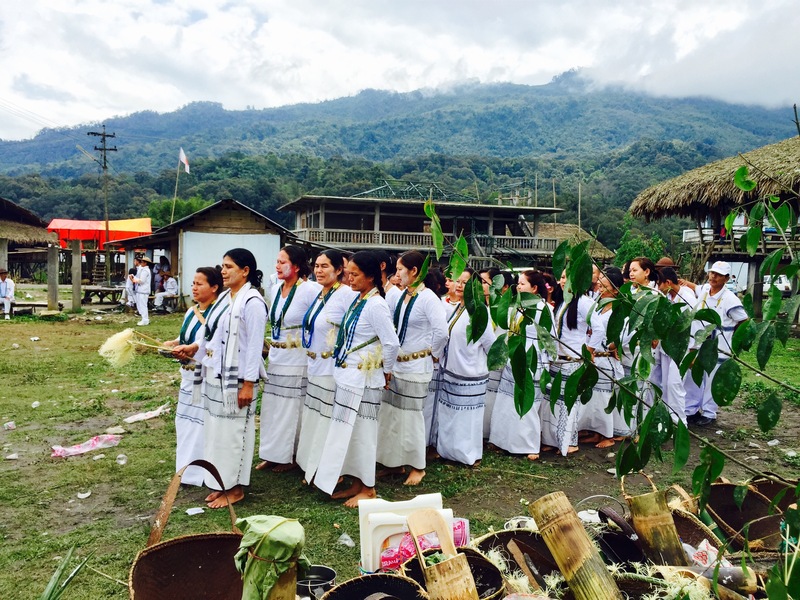 Thanks for visiting Arunachal and penning beautiful lines on The Mopin festival. Thank you so much for this post Shivya 🙂 You bought me back my yesteryears. I have lived most of my life in Arunachal and did my high school in Along 🙂 Apong is one hell of a drink and has a strong smell. Miss the Mopin festival! I am Priyanka Joshi from The Pioneer newspaper. We want article on Mopin festival for Exotica magazine. For further information pls contact me. It’s really superb. I don’t know when I am coming there. Madam are you an Anthropologist ? It is very nice that you have shared your experience. Previous PostSecret Ways to Experience Singapore. Next PostWhat the Village Folk of Kumaon Taught Me About Life.